Andreae Callanan is a poet and writer who lives in St. John's, Newfoundland. 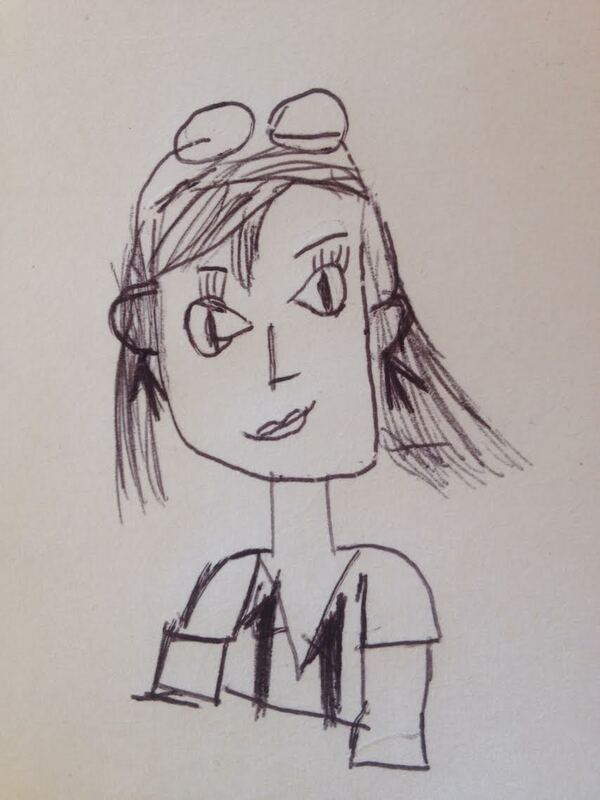 A portrait of Suzanne Buffam by the poet’s daughter. Before my first daughter was born, I swore to live by a new rule: never write about the baby. To me, there could be nothing so distasteful as the woman poet gone domestic, nothing so cliché. I was young, straight out of McGill, unexpectedly pregnant during what was meant to be a year off before grad school. I had been writing poetry in a dedicated way for a few years, publishing in our small student journal and feeling like part of a scene. I wasn’t going to let a baby change me, man. As though this helpless, mewling, scratching creature that I loved ferociously despite the off-putting helplessness could do anything but transform me. I was consumed. Consumed physically, as she nursed for hours while I sobbed on the couch or stood with her at the kitchen counter, one arm reaching to shovel sizzling fish sticks straight from the toaster oven into my mouth, the other supporting her angry pink body, her little lips latched on for dear life. Consumed emotionally, mentally, as she woke me with screams each morning and kept me up until all hours. Very soon it became clear that I really needn’t worry about writing about the baby, because it was unlikely I would ever string together enough thoughts to write about anything. It is difficult enough for a poet to follow up on a strong career start, even without the added emotional and temporal drain of child-rearing. Later the poet-speaker recalls a conversation with “a famous aging editor in New York . . . Did I have any children, he wanted to know . . . I’d just turned thirty-seven and had none. Good, he said firmly. You’ll be finished as a writer if you do.” Given Buffam’s early successes (before the aforementioned Griffin nomination, her debut collection, Past Imperfect, earned her the Gerald Lampert Award), this concern is fair; it is difficult enough for a poet to follow up on a strong career start, even without the added emotional and temporal drain of child-rearing. The famous aging editor’s comment, however archaic-sounding, raises a good question: how do you negotiate a career that depends on time alone with one’s thoughts, on time to read and wander and scribble and ruminate, with a newborn’s need for sustenance, a toddler’s need for steadying, a pre-k’s need for an audience? My mantel and tables are stacked high with partially-begun books and my head rattles with conversations I meant to finish before someone needed a band-aid or a sandwich. Hours stolen away for writing find me with an attention span no better than a two-year-old’s, and by the time I’ve managed to focus my thoughts, it’s time to close the computer and return to the real world. Buffam’s format mirrors this mental and personal disjunction. A Pillow Book takes its name from, and refers frequently to, The Pillow Book of Sei Shōnagon, the famed thousand-year-old Japanese miscellany composed by a poet and court lady of the Heian period. Broadly, a pillow book is a snapshot of a particular period in a writer’s life, its quotidian events and concerns. Buffam’s pillow book engages Shōnagon’s in its form—prose sections interspersed with lists—and through direct interaction with the text, which is read at night by the light of a “Petzel Tikinna 2 headlamp set on low.” Buffam points out that Shōnagon “is rumoured to have borne” a son or daughter, but that this possible child is never mentioned. If you dream about horseflies, houseguests are coming. If you dream about houseguests, houseguests are coming. If you dream about drinking, your in-laws will arrive with bad news from the east. A construction site is a root canal. A root canal is an IRS audit or a preschool fundraiser bakesale or a LinkedIn request from an ex or a day-trip in the rain to the zoo. I am nearly thirteen years into this parenting gig. My husband and I are outnumbered by a ratio of two to one. He, also a poet, has managed to write in fits and starts, while I was fairly certain a year ago that I would never write a word again, in spite of all his support and encouragement. Like the poet in A Pillow Book, what I needed and craved was a good night’s sleep, unbroken by wandering children and unhampered by worry or mental self-flagellation. Buffam writes that Shōnagon, “affords sufficient distraction on one’s pillow at night to transport one to a late Kurosawa dream sequence, but also enough repetitive and inconsequential minutiae to conjure, on a good night, the infinitely gentle god of sleep.” A Pillow Book, by contrast, is engrossing enough to keep a reader up late.